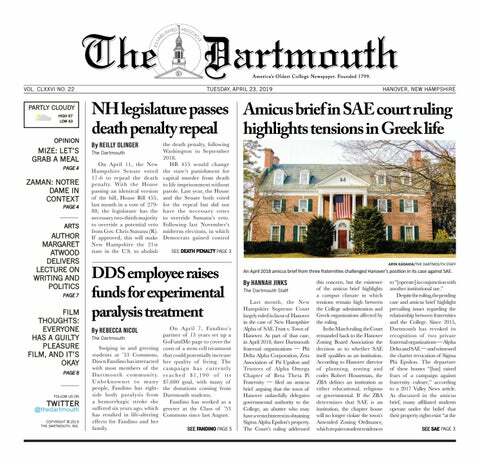 In the first week of January, the Dartmouth Title IX Office announced it launched a mandatory sexual violence prevention training course for school faculty, staff and postdoctoral scholars. “It brings us all to the same foundation ... and then we can talk about the more important things — like the roots of sexual violence and being trauma informed — and that sort of movement will help to change our culture,” she added. The training program was announced on Jan. 3 as part of College President Phil Hanlon’s Campus Climate and Culture Initiative, an initiative that aims to “ensure that academic learning and research take place in an environment that is free from sexual harassment and the abuse of power.” The initiative was launched after the $70 million lawsuit filed against the College in which plaintiffs alleged the College had failed to protect them against sexual harassment at the hands of Dartmouth faculty. The deadline for completing the training is March 13, and reminders are sent out to recipients every two weeks. So far, 34 percent of faculty have finished the module. The online module, called “Bridges: Building a Supportive Community,” was selected through a company called Everfi, also referred to as Lawroom. Everfi provides educational training to colleges and universities, and has over 80 different modules on issues based around campus harassment, compliance and financial accounting. The College has been in partnership with the company since 2002, utilizing training programs and modules such as AlcoholEdu and Sexual Assault Prevention for Undergraduates for freshman students. The Bridges module, which takes 45 minutes to an hour to complete, contains short educational videos and interactive slides defining what falls under sexual misconduct. There are guidelines and information on how to correctly identity and report incidents to the administration. The College began looking at the Bridges program two and a half years ago. However, at the time, few faculty supported the initiative. With the assistance of senior leadership in the administration, the committee recently decided on Bridges and launched a successful pilot, before moving forward with the course this year. For French and Italian professor Loic Lerme, while the content of the training was well-detailed and relevant, he worried about its length. In addition to the online modules, the Student and Presidential Committee on Sexual Assault is pushing the College to implement a mandatory, in-person faculty training to comprehensively address reporting responsibilities, the consequences of trauma, support tools and resources for survivors. SPCSA executive chair Paulina Calcaterra ’19 said she had heard from multiple people that they were concerned about the depiction of a perpetrator and their ethnicity in the module. She said that to some, the ethnicity of the perpetrator in the modules could reinforce harmful stereotypes. An additional online training program for the graduate and professional students is also underway. Because the Sexual Assault Prevention for Graduates course — parallel to the undergraduate SAPU course — doesn’t cover faculty responsibilities that many teaching graduate students take on, the Title IX office is in the process of assessing whether SAPG or Bridges will be a better fit to send out to graduate students. The decision will be made by next week, and the goal date to launch is around Feb. 1. Clemens stressed that the modules serve as a part of a larger plan for change. “We don’t want anyone to think that we’re saying this training is going to fix everything. This is one small star in the greater constellation of things we’re doing to make change,” Clemens said.